The 5 Baht banknotes have little change many times. All types of them are as follows. 5 Bath type 1 the lower left is Thai number and Thai alphabet. 5 Baht type 2 change the number at lower left to Arabic. 5 Baht type 3 delete lower left serial number and change the upper right alphabet to Thai. 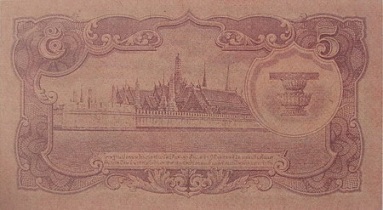 5 Baht type 4 change serial number to 6 digits and change the color of the back side to purple and print the constitution on pedestal tray in stead of watermark. Specimen without signature print specimen in Japanese UNC about 16,500 - 17,500 baht. Type 1 ordinary number signature Pao UNC about 23,800 - 24,300 baht. Type 1 ordinary number signature Pao EF about 18,300 - 19,200 baht. Type 2 ordinary number signature Pao UNC about 28,300 - 30,000 baht. Type 2 ordinary number signature Pao EF about 10,800 - 11,400 baht. Type 3 ordinary number signature Pao UNC about 17,700 - 18,500 baht. Type 3 ordinary number without signature EF about 12,400 - 13,000 baht. 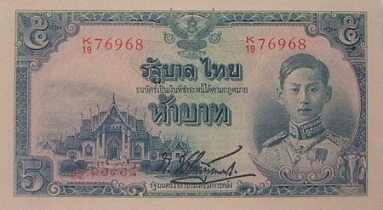 Type 3 ordinary number signature Kuang EF about 9,900 - 10,500 baht. Type 3 ordinary number signature Kuang VF about 8,300 - 8,700 baht. Type 4 ordinary number without signature UNC about 18,300 - 19,200 baht. The price was updated on 11th December 2017. During the World War 2, Thai government had the banknote shortage problem because there was no delivered banknotes from Thomas de la Rue due to England was at war with Japan. The Thai government requested Japan to arrange the banknote printing. The Mitsui Bussan Kaisha Company was commissioned to act as an agent to contact the Japan Printing Bureau. The banknotes later were different from those of early batches because Japan was heavily attacked by the Allies towards the end of the war thus causing shortage in raw materials. For the sea transportation, the first shipments were directly to the port in Bangkok. Later heavier attacked by the Allies, the delivered bypass to Singapore then transported to Bangkok by train. In one shipment, the train arrived to Ta Chang station at Surattani, some boxes of banknotes were stolen. 74,000 of 5 Baht, 224,000 of 10 Baht, 72,000 of 20 Baht and 40,968 of 100 Baht banknotes were pushed by feet from the train. Then the stolen notes were found in circulation with forged signature printed, The Ministry of Finance announced on 24th August 1946 that those notes were illegal. Anyway one those could show evidence of honesty would be accepted. So those illegal notes were so-called Thai Teeb (pushing by Thai's feet) notes and Leng ta Chang (the Minister Leng's signature printed at Ta Chang) notes. 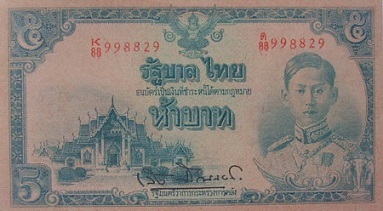 The 5th series 5 Baht type 1 banknotes were announced on 30th July 1942. The 5th series 5 Baht type 2 banknotes were announced on 28th Novemberl 1942. 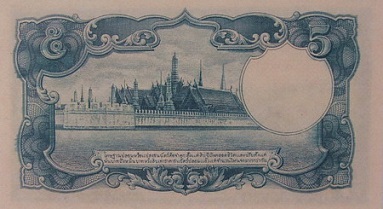 The 5th series 5 Baht type 3 banknotes were announced on 24th Febrauary 1944. 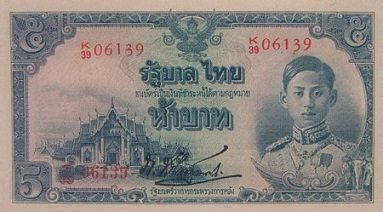 The 5th series 5 Baht type 4 banknotes were announced on 5th March 1945. The main object is the image of King Rama 8 on the right. The left is the image of the Marble Temple in Bangkok. The middle is the "Thai Government" on guilloche design. The serial code and number were printed with red ink. The watermark image is the constitution on pedestal tray. The main object is the Anandasamakom Throne Hall.